High speed pursuit, rammed patrol vehicles, foot chase and seizure of drugs results in arrest of two from Bloomfield — The Worthington Times. What started out as a traffic stop last Wednesday turned into a high-speed pursuit, then a foot chase. Numerous officers from Greene County were involved in the incident which resulted in damage to two sheriff’s patrol vehicles, a crash, and the arrest of a Bloomfield woman on eight criminal counts including drug charges. A passenger in the vehicle was also arrested. Brittany Nicole Knapp, 25, Bloomfield, was arrested by Greene County Sheriff’s Deputy Sgt. Bobby Pierce as was Mathew James Harmon, 32, Bloomfield. Both were booked in to the Greene County Jail early on Thursday, April 4. The incident started out as a traffic stop on Wednesday, April 3. Sgt. 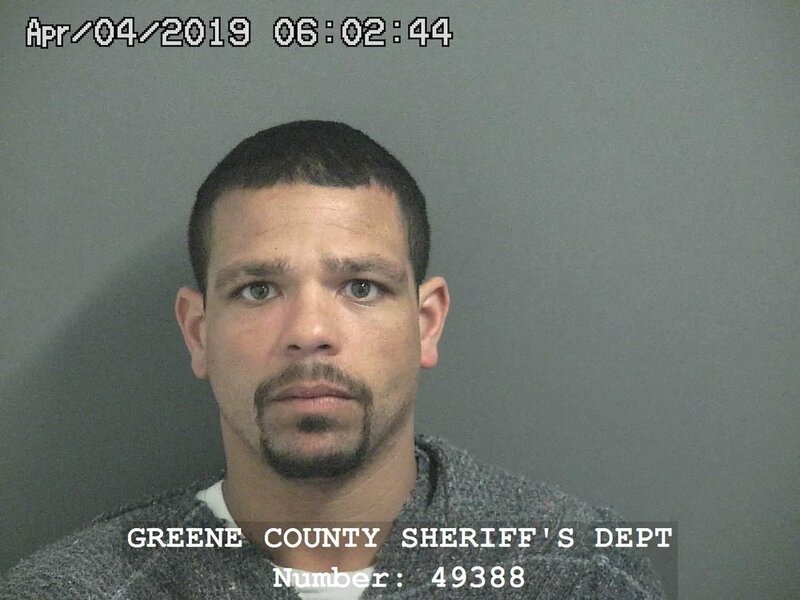 Pierce was traveling behind a silver Nissan Altima when he saw the car drive left of the center line and initiated the stop on State Road 54 just west of Bloomfield. GCSD Deputy Alan Jackson and Deputy Marshal Jordan Allor of the Bloomfield Police Department assisted on the scene. The driver first identified herself as Ashley Hopster but was later was correctly identified to be Brittany Knapp. Matthew J. Harmon was a passenger in the front seat and Paul A. Bridgewater was a back-seat passenger. Sgt. Pierce said Knapp admitted she crossed the center line and said she was “messing” with her radio. She said she didn’t have a driver’s license with her. She offered to give the deputy a debit card to confirm her identity as Hopster. Pierce said Knapp seemed hesitant on her birthdate which was suspicious and indicated she might be lying. Pierce also said he smelled the odor of marijuana coming from the vehicle, along with a heavy perfume smell. When Pierce returned to his patrol vehicle to run status checks on the three individuals, he asked Deputy Jackson to stay with the vehicle and continue talking with them. After Officer Allor arrived, he asked Deputy Jackson and Officer Allor remove the occupants from the vehicle. Officer Allor said Knapp refused to get out of the car. It was at that point that Knapp allegedly put the car in drive and sped off which started a pursuit that involved personnel from multiple law enforcement agencies including the Greene County Sheriff’s Department, the Bloomfield Police Department, the Worthington Police Department, the Linton Police Department and the Indiana State Police. Pierce gave chase as Knapp drove west on SR 54 to the intersection of SR 54 and SR 57 – sometimes called the Lighthouse Junction, where Knapp turned north on SR 57, then turned onto County Road 250 North where she drove off the roadway into a field. Pierce reported that while she was driving in the field, the two passengers jumped out of the car while it was still in motion. Both passengers gave up willingly and were apprehended without incident. Knapp then went back and turned south on SR 57 then turned east on SR 54 to head back toward Bloomfield. “As she approached town limits, Deputy Harvey Holt and Camron Frye set up to deploy stop sticks. Knapp could see the deputies’ emergency lights activated in the distance and turned off State Road 54 onto the drive to Prairie Aggregates. This business was secured by a locked gate. “As Knapp approached the gate, she stopped briefly. I (Sgt. Pierce) approached Knapp’s vehicle with my own. As I got closer, Knapp placed her vehicle in reverse and rammed into my vehicle, shoving me backwards. Knapp then placed her vehicle back in drive and drove through the secured gate of Prairie Aggregates. “I continued pursuing Knapp into the business property. In the back of the property, Knapp quickly spun her vehicle around and again struck the front of my vehicle. While exiting the property, Knapp struck Deputy Holt’s vehicle in the back passenger side. “Knapp exited the property and drove east on State Road 54 into Bloomfield town limits. Knapp continued at a high rate of speed through town onto State Road 54 eastbound. “Knapp led law enforcement east on State Road 54, through the east side of the county, into the Eastern Greene area. While traveling State Road 54, Knapp continued at a high rate of speed in excess of 90 mph, passing vehicles in a no-passing zone and traveling left of center on numerous occasions. “Knapp approached the intersection of State Road 54 and State Road 445. Knapp turned onto State Road 445 towards State Road 45. While on State Road 445, Knapp turned into Lawrence Hollow Drive. “Knapp continued onto Lawrence Hollow Drive where she led officers to the back of Lawrence Hollow, Algood Drive. On Algood Drive, Knapp lost control of her vehicle and wrecked into a residential yard/fence. “After Knapp wrecked the vehicle, I observed Knapp exiting the vehicle and run on foot. I chased Knapp through a back yard and watched her enter the back door of a trailer, later discovered to be her parents’ residence. Once inside the trailer, Sgt. Pierce quickly spoke to a Knapp’s mother who said she believed Knapp had run out the front door. So Pierce went out the front door and as officers were searching the property, ISP Trooper Klun saw movement in some bushes and announced his presence – Knapp took off running again. Knapp then ran into the back of her parents’ trailer and officers pursued, secured the trailer and found a bedroom door to be locked. Sgt. Pierce asked for a key to the bedroom which could not be located but Pierce said Knapp’s mother said they could kick the door in if needed. And so they breached the door. Knapp was found hiding in a closet of the bedroom and was removed but she resisted being placed in handcuffs saying she hadn’t done anything wrong and didn’t know why she was being detained. She was placed in handcuffs but then physically resisted being placed in Trooper Klun’s patrol vehicle. Knapp was placed in the vehicle and transported to the Greene County Sheriff’s Department. She was determined to be in an intoxicated state and was then transported to Greene County General Hospital for an evaluation. Pierce reported that when the vehicle was searched, a long list of numerous drug items and paraphernalia were seized. All items of evidence have been sent to a lab for evaluation – results pending. When Knapp was interviewed later at the sheriff’s department, Knapp is reported to have told several stories which were determined to not be true. She allegedly said one of the passengers had held a gun to her head during the traffic stop and that is why she took off, and that the gun was thrown from the vehicle in the field – Sgt. Pierce said this was determined to be a lie. Later, Knapp allegedly said she ran because of her warrants out in Monroe County for dealing and possession of methamphetamine. She also said any drugs or syringes in the vehicle belonged to her passengers which was not believed to be true. When Bridgewater was interviewed, he said he did not know Knapp very well, had met Knapp and Harmon in Bloomington and they were headed to Worthington to hang out with friends. He said none of the drugs found in the vehicle belonged to him and that he didn’t know they were in the car, he didn’t know Knapp had a warrant out for her arrest and he had not anticipated she would run. When Harmon was interviewed, he said Knapp got frightened during the traffic stop, knew there was a warrant out for her and decided to run. He said he tried to get her to stop but she wouldn’t so he and the other passenger had to jump from the car. He said he didn’t know she was going to run. When asked if he had asked Knapp to let him out of the vehicle, he allegedly said, “the whole damn way.” He said Bridgewater was also asking to be let out but she refused to stop. Harmon had a backpack in the vehicle which contained a syringe. Assisting a criminal, a Level 6 felony. He was being held without bond pending his appearance in court. An initial hearing in Greene Superior Court is scheduled tomorrow morning, Tuesday, April 9. When GCSD Det. Shawn Cullison located and talked with Hopster, she told him her social security card, Hoosier Works card and other identification cards had been stolen and that she had reported the theft to an officer with the Bloomington Police Department. She said Knapp did not have her permission to use her identity. Reckless driving at unreasonable high or low speed that endangers safety, a Class C misdemeanor. She was being held without bond pending her appearance in court. An initial hearing in Greene Superior Court is scheduled tomorrow morning, Tuesday, April 9. Regarding the damaged patrol vehicles, GCSD Chief Deputy George Dallaire reported one sustained minor damage, the other sustained damage to the front end, but both can be repaired. A cost estimate was not yet available as of early Monday morning.